You knew this was coming, right? What’s the first, most logical thing one would create with peanut milk? Exactly. Nothing earth-shattering here, folks, just the usual rock-solid-delicious smoothie suspects paired with their new friend, peanut milk, all mixed up together into an irresistible shake-like consistency. Spoon required. Hey, you!! Have you signed up for the Virtual Vegan Potluck? No? What are you waiting for?! I’m looking for vegan and vegan-friendly bloggers to contribute a dish for the world-wide, plant-based Potluck shindig happening on November 1. Go here to sign up! Peanut milk is a little unconventional, sure, but it makes for a delicious smoothie when combined with bananas and cocoa powder! Place all ingredients except for cacao nibs and peanuts in a high-powered blender. Blend until smooth, thick and creamy – add more peanut milk if mixture is too thick. Haha! Save this one for dessert :-)! Somer you sound like me and my friends! You know you are great friends when you can call each other “temptress” in good fun. And I agree! I’m thinking of having this for breakfast now. I’m sure I have a few frozen banana’s in the freezer. 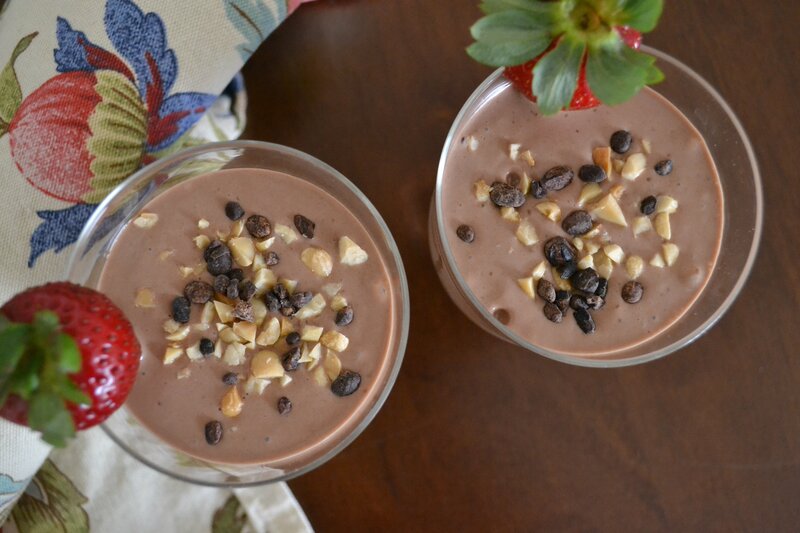 This shake would be perfect with Somer’s Oatmeal Chocolate Chip Cookie Bars. I’m swooning over those too! 🙂 – ooh, great idea about the cookie bars – yum! Friends that you can lovingly insult means the best kind of friendship 😉 Oh the combo of the cookie bars and this shake sounds positively dangerous. Hey, how about joining the Potluck on Nov. 1?? I must honest, I’ve had two dates and 3 gigantic cups of black coffee. I need to up the antioxicants and chocolate right now with this. Can you make me one? C’mon over! And I’ll pour us both another coffee, too! Yay! So glad! Thanks, Richgail! Oh yeah – that would work quite nicely, Shira! Coming from the smoothie queen, that means a lot, Sophie! Have a lovely weekend! Super yum. My kids just might get really lucky this weekend and eat some of this. Thank so much! Ahhh, and the weekend is nearly upon us! So pretty! It’s like a blended banana split! Hey, you’re right! That’s what I should’ve called it! As soon as I saw the photo at the top, I thought to myself, Kel certainly picked a fine lady there! This looks magnificent, it would be a wonderful pudding. Awww! Mmmm, pudding… You are onto something there! peanut butter chocolate banana is my favorite combo! Hard to miss, isn’t it ;-)? Nice to meet you, Melissa! That looks so good. I’ve never heard of peanut milk! I know, crazy, right?! So good! I NEED one of these right now! Awesome! I could use one right about now, too! !